A sweet shirt for boys for Valentine's Day. 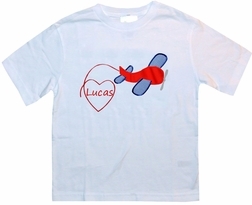 We start with a white shirt and applique it with an airplane forming a heart with his tail smoke. And, inside the smoke is your little one's name in red.